French Emblems: Emblem: Uxoriae virtutes. Vacat obstruendo dentium septo altera. Ipsamque cura opum tuendarum addecet. A tortoise is trodden under her foot; safe in her right hand she holds a key; The other is free to cover the enclosure of her teeth. A wife should not go wandering abroad, nor be idle, And it befits her to have a care for her worldly goods that need looking after. mi suae operam (cuius explicatio XXII. embl. rum custodiam, postremò linguae continentiam. This emblem embraces the three principal endowments of a wife, to wit: staying at home to take care of the household (on which Emblem XXII ([FJUb022]) sheds light); next, the guardianship of the wealth and goods accrued by the labours of her husband; and last, a control over her tongue. Therefore the picture should show a woman in an upright posture, holding before her in her right hand a bunch of keys; with her left hand pressed to her lips, in which appearance the goddess Angeronia, patroness of silence, was portrayed in antiquity, with her mouth bound and sealed up. 1. ‘Praenexo obsignatoque ore’: quoted from Julius Solinus, Polyhistor, 1.6. 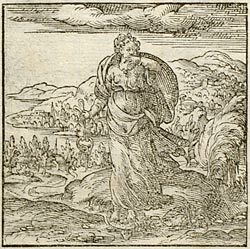 Angerona (occasionally -ia) was the goddess of Suffering and Silence.